Marisa González, Scientific Director of NANBIOSIS Unit 16 Surface Characterization and Calorimetry Unit, runs for elections to the Rectorate of the University of Extremadura, to be held on November 27. Marisa González, Professor of Applied Physics in the Faculty of Sciences and the Group Leader of Microbial Adhesion research group of CIBER-BBN at University of Extremadura, she works with implants and materials on contact with body fluids and tissues, such as blood or bones, and the importance of knowing how these surfaces interact with proteins and molecules in the blood, and how they would do it in case of that bacteria could arrive that could cause infections in our organism. 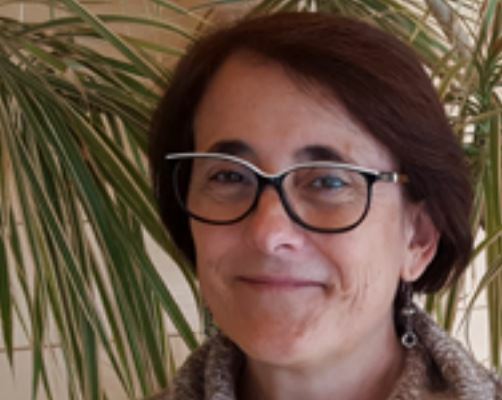 In addition to teaching and research, Marisa has experience in the management of the University of Extremadura, she has been, for example, director of the departments of Physics and Applied Physics. In these sense, although Marisa González already stressed that she would not flag her condiction of woman, the truth is that if she wins she would be the first woman to lead the UEx. In fact, it is the first time that there is a female candidate. 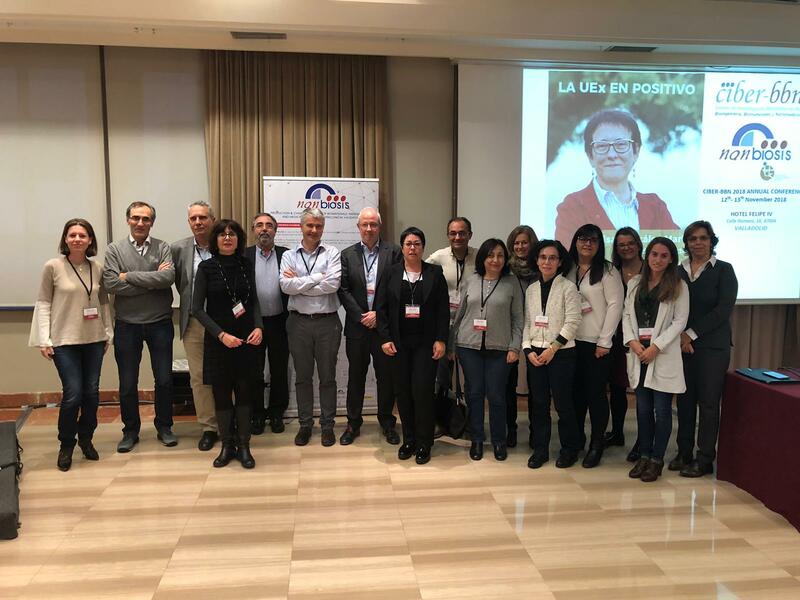 In the picture members of CIBER-BBN and NANBIOSIS for Marisa to the UEX in postive! On February 22nd, the National School of Health of the Carlos III Health Institute hosted the forum on Smart Biomaterials and biomedical devices for applications in drug delivery and regenerative medicine, organized by the ICTS Nanbiosis, an infrastructure shared by the CIBER-BBN and the Center of Minimally Invasive Surgery Jesus Usón (CCMIJU). This is the first groups/companies meeting organized by Nanbiosis, in which about 70 B2B meetings were held. 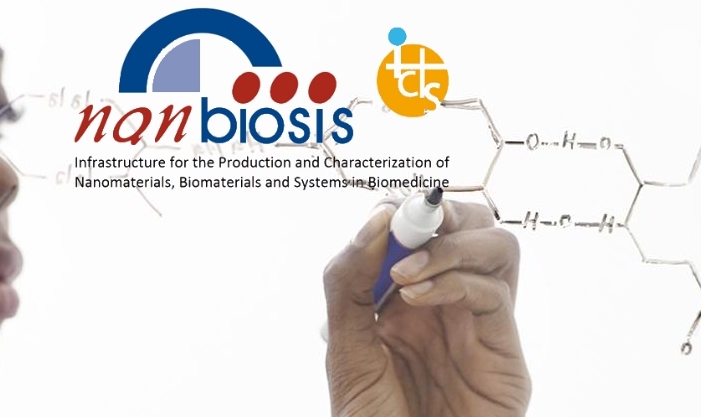 The meeting brought together about 40 participants from 14 research groups (from the CIBER-BBN and the CCMIJU) and 10 companies, which discussed the latest advances in the research lines developed by the groups and platforms of Nanbiosis and on the needs and demands of the industry in smart biomaterials and devices for targeted drug delivery and regenerative medicine. Jesus Izco, Coordinator of Nanbiosis, presented the new “Cutting-Edge Biomedical Solutions“, soon available on the ICTS website. 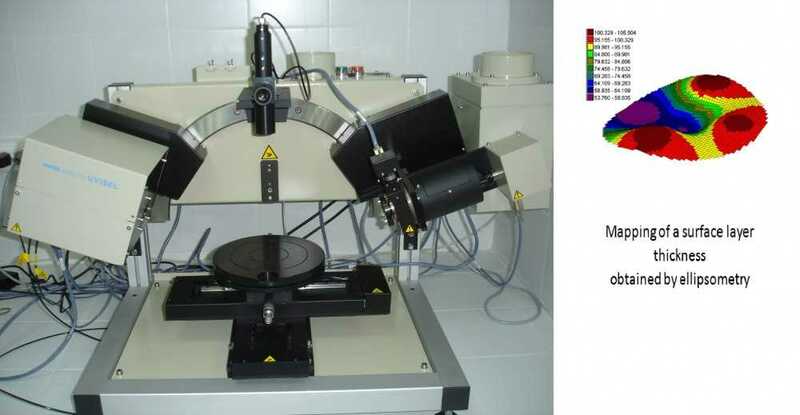 These are integrated solutions to advanced challenges in nanomedicine, biomaterials, medical device, and diagnostic that can be developed by several units under a one-stop shop model, optimized with the experience and scientific and technical knowledge of the research groups of excellence that manage the involved units. 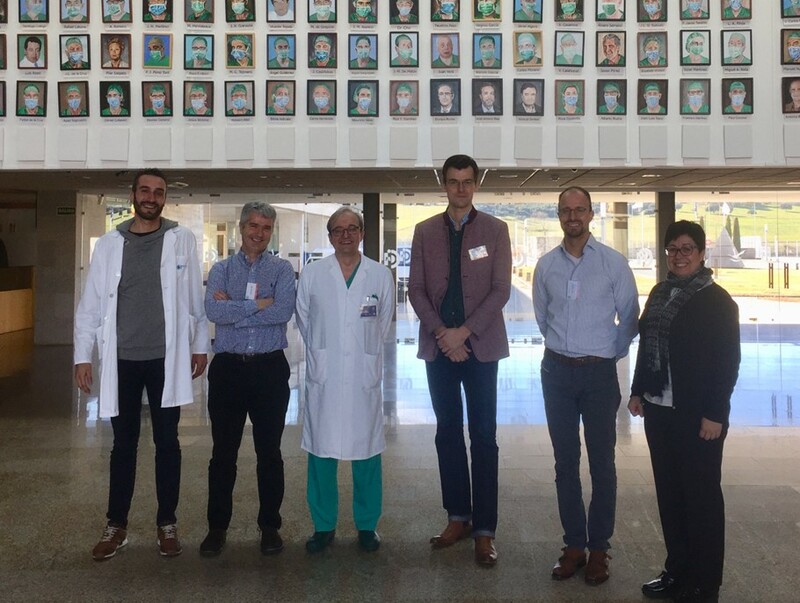 Some of the Cutting-edge biomedical solutions presented in the meeting were preclinical validation of biomaterials, mechanical and surface characterization, biocompatibility and studies of biofilm formation and infections. 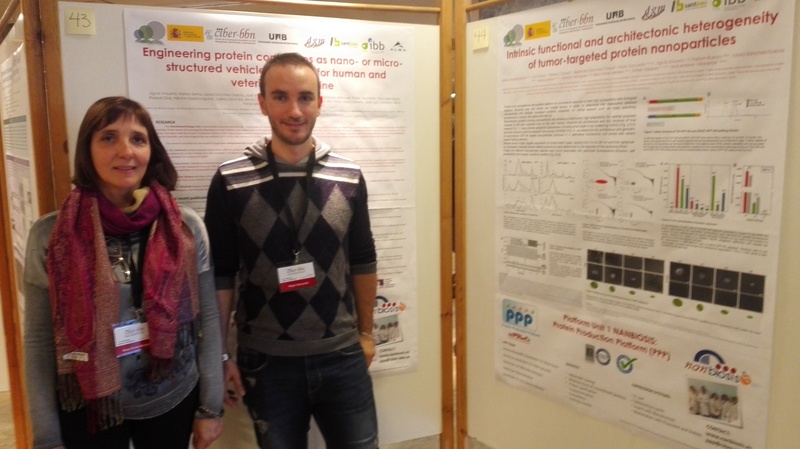 The CIBER-BBN prsentations were: “Instructive materials for regenerative medicine” by Miguel Ángel Mateos (NANBIOSIS U5 IP: Elisabeth Engel); “Molecular biomaterials for drug delivery and biomedical applications” byNathaly Veronica Segovia (NANBIOSIS U6 / IP Jaume Veciana and Nora Ventosa); “Advances with micro-nano technologies for in vitro devices and point of care” by Rosa Villa (NANBIOSIS U8 ); “Development of new dosage forms for advanced therapies based on new biomaterials” by José Luis Pedraz (NANBIOSIS U10); “Contact lenses functionalized for the prevention of corneal infections” by Jordi Esquena (NANBIOSIS U12 / IP Carlos Rodríguez); “Combined in-silico and in-vitro models of the cell microenvironment and drug delivery effects in cancer and tissue engineering applications” by Fany Peña (NANBIOSIS U13 / IP Miguel Á. Martínez); “Surface of the biomaterial: the first contact with our body” by Marisa González (NANBIOSIS U16 ); “Use of biomaterials for the repair of soft tissue defects” by Bárbara Pérez Khöler (NANBIOSIS U17 / IP J M. Bellón and Gemma Pascual); “Controlled release systems based on mesoporous materials with molecular doors for applications in therapy and diagnosis” by Ramón Martínez Máñez (NANBIOSIS U26); “New intelligent devices and biomaterials for the treatment of pathologies of the retina and the nervous system” (Eduardo Fernández); and “Near-infrared responsive scaffolds for biomedical applications” (Nuria Vilaboa). On the part of the CCMJU, the presentations were the following: “Application of Mesenchymal Stem Cells in preclinical models for surgical and cardiovascular research” by Javier García Casado (NANBIOSIS U14); “Regenerative medicine in animal models of cutaneous healing and diabetic models” by Beatriz Moreno (NANBIOSIS U19); “Preclinical studies of biomaterials” by Idoia Díaz-Güemes (NANBIOSIS U21 /IP: FM Sánchez Margallo); “Porcine model of myocardial infarction as a translational research platform in regenerative medicine” by Verónica Crisóstomo (NANBIOSIS U24). In the turn of the companies, they presented some collaboration opportunities AJL, i-Vascular, Praxis Pharmaceutical, Technical Proteins Nanobiotechnology and REGEMAT 3D; and they also participated in the Rovi, Viscofan, Biomag and Biogelx Laboratories forum. These meetings, where links are established between research groups and companies, address issues of business and scientific interest, allowing direct contacts between researchers and business managers.